Losing a child will be the most difficult loss in your life, but you can and will get through it. One of the most productive ideas for your well-being after the death is choosing to find a cause, a reason to move on with your life. Parents may become active in different organizations. These include: Compassionate Friends, Bereaved Parents USA or Alive Alone for childless parents. Not only do they join these organizations to help themselves, but in time, they start helping others who are just beginning the journey. Others who want to become even more involved get on the boards and help in any way they can to keep the organization vibrant for those who follow. Organizations such as Parents of Murdered Children or the survivors of suicide victims have volunteers who help man the phones. By becoming involved you are not only helping the organization, you are helping yourself to grow and move on. Other parents volunteer in senior centers, in youth organizations and children’s hospitals. Volunteers are always needed to help with small things like running errands, walking someone in a wheel chair, changing diapers and playing with both young and older children. You do not need to have a skill to work with these organizations, but if you do, that makes it all the more worthwhile to help in these areas. One mother whose daughter was killed by a drunk driver became active in MADD where she can not only help others to become responsible drivers but also talk about her daughter and tell these people how much her daughter meant to her. Another mother whose daughter was also killed in a car accident now speaks to a Victims Impact Panel in the city where she lives, where part of the criminal’s retribution is to listen to parent’s stories and understand the loss. 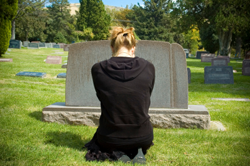 Becoming this involved helps some parents deal with their loss. A couple works to educate medical professionals on how to react to parents who have just lost a child within the hospital setting. Their efforts have started a movement throughout the U.S. to see that grieving parents deal with compassionate medical personnel. A father who lost three children in different car accidents has started his own Compassionate Friends chapter in his hometown and finds a new purpose to his life. New groups start all the time in a variety of cities dealing with infant loss, SIDS, still births, cancer and other causes of death. All of these examples make an important point: when you help yourself, you can, in turn, help others. When you are thinking of others and not only your own situation, you are moving forward. Everyone becomes a winner. Having a cause, a purpose in life, can be very rewarding. You will know when it is right for you and when everything will fall in place. Until then, keep working on your grief journey and what you want to do with the rest of your life, try to set a goal and aim to reach the sky. Thanks for this article. So many people use volunteering to pull themselves out of despair. Volunteering is an excellent way to help when you are grieving. To help others while you are in pain provides a huge emotional benefit. I break volunteering into two types. One is the hands-on kind that is physical (and maybe tiring) which is excellent for all that pent up energy. Packing books, working at a food pantry, raking and shoveling at a park – getting some serious physical work is great to combine with the great feeling from helping others. It’s a powerful combination. The second kind is the advocacy volunteering that many people get involved in – working on legislation, fundraising, raising awareness – more intellectual activities that are usually directly related to the loss. Volunteers feel as though they are part of the whole, part of a solution. Grieving people should think about what they need and choose the activities that fit.